Some altered states of consciousness take place in the ordinary course of everyday living, while other, more profound, "mystical" experiences require disciplined training in meditation. In either case, the alteration in consciousness appears to be mediated by an alteration in attention. Traditionally, it has been assumed that there is a close relationship between consciousness and attention. We become consciously aware of objects and events by virtue of paying attention to them. 'Preattentive" processing is preconscious processing. However, Koch and Tsuchiya (2007) noted that the relationship between attention and consciousness is more complicated that that, and that it is possible to construct a 2x2 table consisting of the crossing of two factors: Attending-Not Attending and Conscious-Not Conscious. It is possible to pay attention to invisible objects. In subliminal or masked stimulation, the subject pays attention to a region of space in which he consciously sees nothing. And it is also possible to become conscious of something even though we are not paying attention to it. An example is the phenomenon of "pop-out" in visual search, in which a distinctive stimulus captures our attention. Still, there are a number of attentional lapses in consciousness, discussed in the lectures on Attention and Automaticity and Implicit Cognition (Mack & Rock, 1998; Kim & Blake, 2005; Kanai et al. , 2010). Inattentional Blindness. where subjects ignore an object in an attended region of space. the contrast here is with perceptual blindness, as in subliminal masked stimulation. There are also a number of forms of attentional blindness, where subjects fail to consciously see objects that are presented supraliminally, even though they are paying attention to them. Repetition blindness, where subjects fail to notice a looked-for stimulus repeated in the RSVP procedure. The attentional blink, in which subjects fail to notice a stimulus occurring just after a looked-for target. Change blindness, in which subjects fail to notice that a stimulus presented in RSVP has added or lost a feature. These attentional failures of consciousness occur under strictly controlled laboratory procedures. In these lectures, however, we are going to focus on alterations in consciousness, mediated by alterations in attention, that occur outside the laboratory in the ordinary course of everyday living. While the peak experience and flow are generally assessed impressionistically, Tellegen has developed a specific instrument, the Tellegen Absorption Scale, to measure individual differences in absorption. Factor-analytic studies of the internal structure of the TAS reveal six major dimensions of absorption. Openness is the latest iteration of a dimension that, in the late 1940s, was called intellectance, and in the mid-1960s was called culturedness. Intellectance means having intellectual as opposed to practical interests -- or, if you will, giving the appearance of being intelligent, which is not necessarily the same thing as actually being intelligent. Actually, research from my laboratory indicates that Openness to Experience is actually composed of three dimensions which are conceptually and empirically quite different from each other. 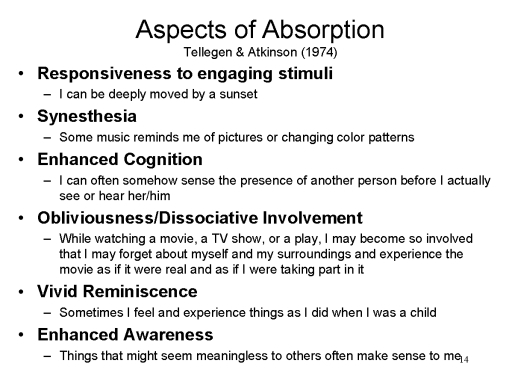 Absorption proper, consisting of absorption, rich fantasy life, aesthetic sensitivity, and awareness of inner feelings. Socio-Political Liberalism, consisting of intellectual curiosity, openness to unusual ideas, variety in thought and action, and liberal value system. Intellectance, consisting of an inquiring intellect and culturedness. The best-documented correlate of absorption is hypnotizability -- although the correlations are not nearly high enough to permit the Absorption Scale to predict response to hypnosis. 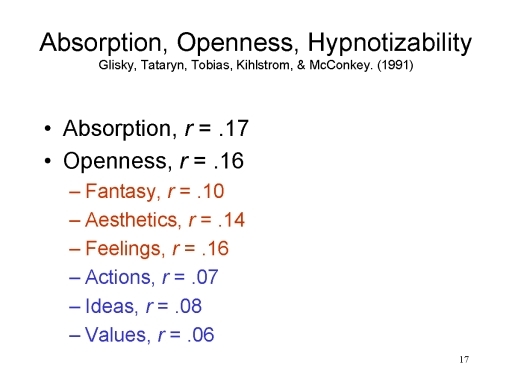 Not surprisingly, hypnotizability is also correlated with Openness to Experience, although the correlations are much higher for those facets that are conceptually related to absorption, than for those facets that are related to "liberalism". 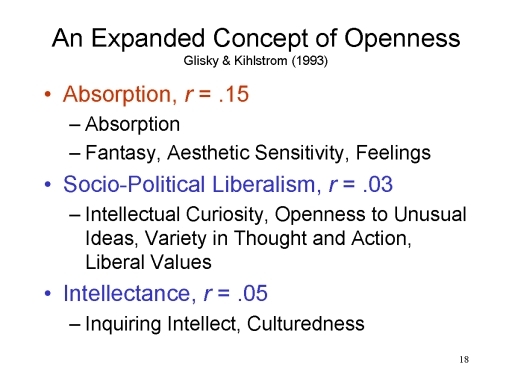 Openness is also related to a dimension of personality sometimes known as intellectance. Hypnotizability is related to the absorption component of openness, but not to either socio-political liberalism or intellectance. Absorption, intellectance, and liberalism are probably not closely tied together -- they appear to fall together in analyses of the "Big Five" personality traits for psychometric reasons that are, frankly, boring. The important point is that people can get absorbed in experiences and activities even if they don't have particular intellectual leanings, and even if they're not particularly liberal in their political and social attitudes! Link to a page containing the TAS and scoring instructions. We have probably exhausted the research we can do on absorption with impressionistic or questionnaire measures of the construct. Now it is time to start experimental research on the cognitive mechanisms of absorption and flow (hint, hint...). A clinical interview study by Josephine Hilgard (1970) found that people who are highly hypnotizable had a history of strong "imaginative involvements" in various domains. Reading, and, as a child, being read to, becoming intensely involved in the story line, identifying with the characters, feeling the emotions depicted on the page. Drama, including acting as well as viewing from the audience. Sensory stimulation, including nature, art, music, and direct sensory experience (such as odors or tastes). Adventure, including both physical and mental "space travel". Vivid imagination: The experience of reading is equivalent to living the experience itself, creating a fantasy that is totally compelling. Visual imagery stimulated by the text may be in color, and it may be three-dimensional; but all modalities of imagery may be involved. Oblivious to true reality: during the time that they are engrossed in a text, absorbed readers may "tune out:" external stimuli that might distract them from the reading experience. Unaware of active imagination: the absorbed reader is swept away by the book, but is unaware of the fact that he or she is actively creating the fantasy experience in his or her own imagination. The reader may be alert to important events, but this "alertness" occurs at a nonconscious level, rather than as an active, deliberate, conscious scanning of the environment. Empathic identification, in which the reader is able to predict what the character will do next. Hilgard also identified a number of characteristics of involved readers, who are especially susceptible to the book-reading fantasy. They are strongly influenced by the power of words. They are not passive readers, but actively open to the influence by the text. They take pleasure in the experience of book-reading. They have vivid mental imagery, especially in the visual domain. While they are reading, they are able to suspend critical processes which might interfere with getting involved in the story. The book-reading fantasy is time-limited. They might read a chapter a day, and then close the book and do something else. When they were read to at night as children, the reader would come to the end of a chapter, or maybe the book, and then say "It's time to sleep now" and turn out the light. Victor Nell (1988), a South African psychologist, developed the concept of ludic reading, or reading for pleasure, which he argued entailed an actual change in consciousness through "the world-creating power of books" and the reader's effortless absorption" in the material being read. Ludic reading is playful, and stands outside the reader's ordinary life. Ludic reading absorbs the reader -- or, in Nell's terms, the "player" completely. Ludic reading is unproductive, in the sense that it does not serve the reader's vocational or other extrinsic goals. As with Hilgard's time-limitations, ludic reading is circumscribed by space and time -- it is reserved for a particular place, like a favorite chair, and a favored time, such as right before sleep. Ludic readers typically read at least one book per week of fiction or narrative nonfiction. 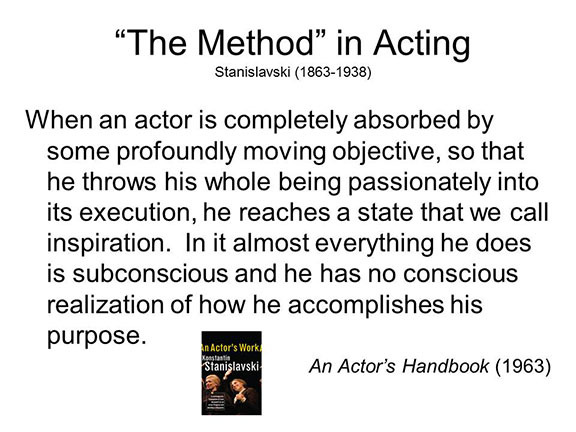 The Russian theater director Constantin Stanislavski (1863-1938) developed the concept of The Method in acting, by which the actor becomes completely absorbed in his or her role. The Method, which is clearly distinguished from technical acting, was popularized in the United States through The Actor's Studio in New York, whose products included Marlon Brando and many other famous actors. Flow is a "focused and ordered state of consciousness" during which the person's "mental energy flows effortlessly". In other words, task performance is automatic -- or, at least, is experienced as automatic. The subject's task must be congruent with her or her personal goals. Flow contrasts with what Csikszentmihalyi calls psychic entropy, in which the task conflicts with the subject's existing intentions, and prevents their execution. It occurs when there is a perfect match between the subject's skills and the demands of the task he is performing. If the task demands less, then the subject may get bored. If the task demands more, then the subject may get frustrated. Flow, in turn, is an aspect of what Maslow's (1954, 1968) has called the peak experience. In the 1950s, Abraham Maslow developed a theory of motivation centered on a pyramid of needs. In Maslow's view, needs at a particular level of the pyramid can be satisfied only once needs at all lower levels have been satisfied. at the lowest level are physiologic needs, such as hunger and thirst. Then safety needs, such as for clothing and shelter. Then belongingness and love needs, such as for friends and intimate relationships. Then esteem needs, such as for competence, approval, and status. Then, after all these other needs have been satisfied, there are self-actualization needs, having to do with achievement of the individual person's unique potential. Self actualization is associated with what Maslow called B-values (where the "B" stands for "Being"), such as perfection, justice, beauty, and truth. Achievement of self-actualization gives rise to the peak experience, which Maslow describes in almost mystical terms: "the experience or the object tends to be seen as a whole, as a complete unit, detached from relations, from possible usefulness, from expedience and from purpose". In such a state, Maslow thought, the subject experiences a "unity of consciousness" in which "the whole world is seen as... a single rich live entity". 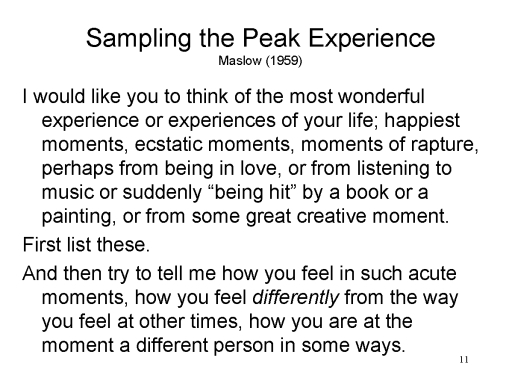 Maslow trained as an experimentalist (at Wisconsin, under Harry Harlow, doing research on rhesus monkeys no less), but when it came to studying the peak experience, all he could do was fall back on subjects' self-reports of "the most wonderful experience" in their lives, which were then coded impressionistically to yield the characteristics of the peak experience described above. More recently, UCB's Dacher Keltner and his colleagues have developed a method for studying the related experience of awe (Keltner & Haidt, 2004). In one study, for example, Shiota et al. (2007) exposed subjects to the Tyrannosaurus Rex skeleton on the UCB campus. This procedure was successful in eliciting feelings of awe in many subjects. Link to Faculty Lecture by Dacher Keltner on "The Evolution of the Sublime: The Science of Awe" (09/05/2014). 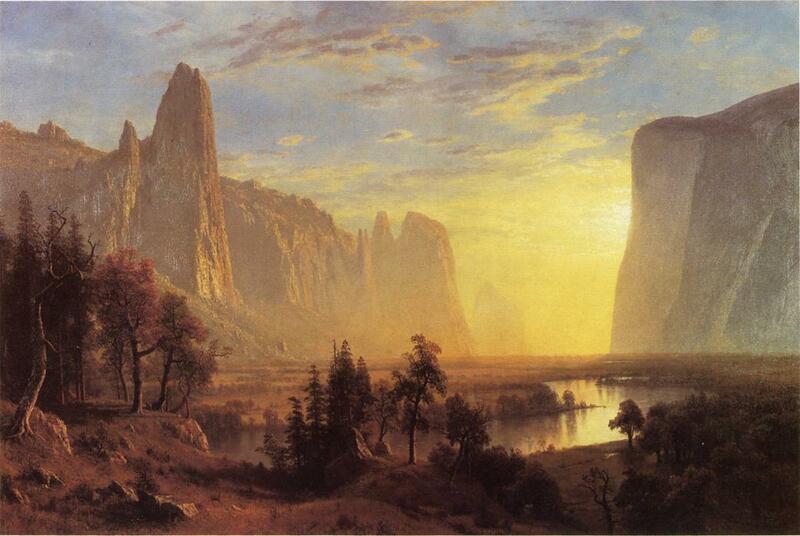 Early in 1851, during the frenzy of the California Gold Rush... the Mariposa Battalion... came to a narrow valley surrounded by towering granite cliffs, where a series of waterfalls dropped thousands of feet to reach the Merced River on the valleuy's floor. One of the men, a young doctor named Lafayette Bunnell, found himself transfixed by the vista. "As I looked, a peculiar exalted sensation seemed to fill my whole being," he wrote, "and I found my eyes in tears with emotion. I said with some enthusiasm... "I have here seen the power and glory of a Supreme Being: the majesty of His handy-work is in that 'Testimony of the Rocks'". Descending towards the Yo-Semite Valley, we came upon a high point clear of trees, from whence we had our first view of the singular and romantic valley; and as the scene opened in full view before us, we were almost speechless with wondering admiration at its wild and sublime grandeur.... 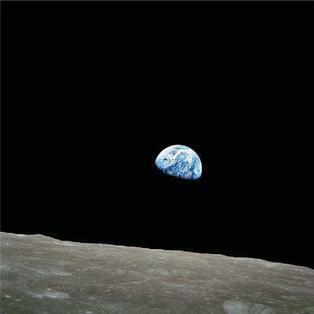 If man ever feels his utter insignificance at any time, it is when looking upon such a scene of appalling grandeur. Just as Maslow's concept of self-actualization was at the center of the humanistic psychology that developed in the 1950s and 1960s as an alternative to both psychoanalysis and behaviorism, so Csikszentmihalyi's concept of flow is an important component of the positive psychology that began to emerge in the 1990s. Although they're obviously related, there are some important differences between humanistic and positive psychology. For a comparative analysis, see Waterman (2013). You might consider getting a job waiting tables after reading Mike Rose's "The Mind at Work". Rose emphatically does not romanticize the workers he describes, who include electricians, welders and waitresses. Rather, he shows how mentally absorbing work can be for those who cultivate a particular skill, however narrow that skill might seem. A restaurant is both structured and chaotic. The busier it gets, the more "on" an experienced waitress tends to become, at once calmed and energized by an awareness of her own skillful performance. She moves in a circuit of heightened efficiency that gets smoother with each added demand. She does this while keeping the cook happy and the cranky customer docile, and playing you like a fiddle to get a bigger tip. She is a sort of entrepreneur. In this deeply humane book, Rose helps us see the human excellence on display all around us, in jobs that often go unnoticed. If in absorption attention is tightly focused on some experience, in daydreaming attention drifts away from its original object. 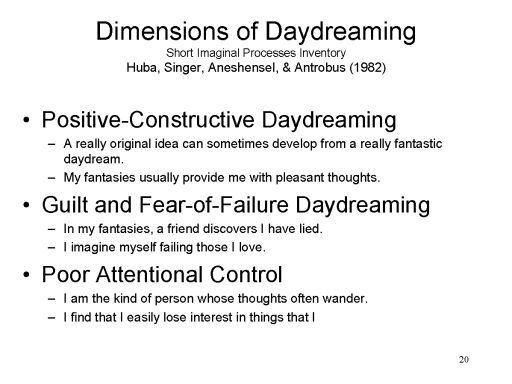 Singer & Antrobus developed the Imaginal Processes Inventory to provide an exhaustive survey of the daydreaming experience. They sat down and wrote items covering every conceivable aspect of daydreaming, resulting in a very long questionnaire. Because the IPI is somewhat unwieldy in actual use, Huba et al. developed a short form, the Short Imaginal Processes Inventory, which measures three broad dimensions of the experience. Of course, people can become absorbed in their daydreams. Although absorption and daydreaming would appear to be polar opposites, it's also true that people can become absorbed in their daydreams. For that reason, there is actually a moderately high correlation between the two states. 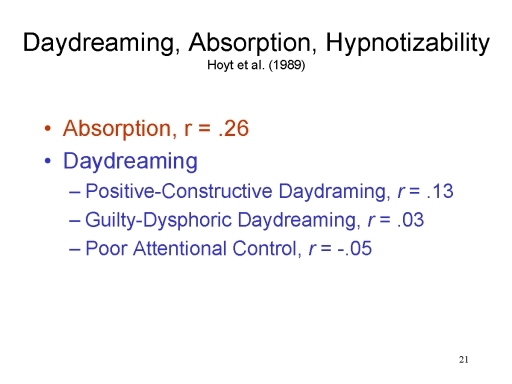 Hypnotizability is not as highly correlated with daydreaming as it is with absorption. To the extent that hypnotizability is correlated with daydreaming at all, the correlations are strongest with positive-constructive daydreaming. Experimental studies of daydreaming may serve as a kind of model for the sort of laboratory research that might be done on absorption. In one early study, Antrobus (1968) recruited subjects for a vigilance task that lasted all of 2 hours! the subjects were supposed to listen to a tape, and press a specific button whenever they heard a specific tone. To keep subjects motivated over the course of this very long experiment, they were given a monetary reward for each hit. 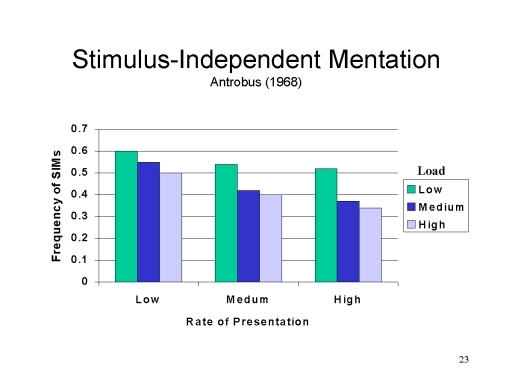 Antrobus also varied the informational load, varying both the number of different tones (1, 2, or 3) and the rate at which they were presented (1 tone every 5, 1, 04 0.5 seconds). Every 15 seconds, he used a "thought-sampling" method to probe for stimulus-independent mentation or task-unrelated intrusive thoughts (TUITs) -- that is to catch the subjects daydreaming. The finding of the experiment was that daydreaming occurred frequently, but the more so under conditions of light cognitive load. When the subjects' cognitive capacity was more fully engaged, the frequency of daydreaming went down. But it was still pretty high, no matter what the informational load. Based on more recent research of this type, Stawarczyk et al. (2010) has introduced a two-way classification of stimulus-independent and task-unrelated thoughts (SITUTs). When thoughts are task-related and stimulus-dependent, the subject is performing the task as it is supposed to be performed. Daydreaming occurs when thoughts are both task-unrelated and stimulus-independent. Link to a page containing the SIPI and scoring instructions. The Cognitive Failures Questionnaire (CFQ) was developed by Broadbent et al. (1982) -- yes, the same Broadbent who proposed the filter theory of attention -- to assess the frequency with which people experienced cognitive failures, such as absent-mindedness, in everyday life -- slips and errors of perception, memory, and motor functioning. Scores on the scale predict episodes of absent-mindedness in both the laboratory and everyday life, including slow performance on focused attention tasks, traffic and work accidents, and forgetting to save one's data on the computer. Forgetfulness: "a tendency to let go from one's mind something known or planned, for example, names, intentions, appointments, and words". Distractibility: "mainly in social situations or interactions with other people such as being absentminded or easily disturbed in one's focused attention". False Triggering: "interrupted processing of sequences of cognitive and motor actions". Link to a page containing the CFQ and scoring instructions. If absorption and daydreaming count as altered states of consciousness, and absent-mindedness and mind-wandering count as lapses of consciousness, boredom also has to count as some kind of altered state of consciousness. In a pioneering study of boredom by Thomas Goetz and his colleagues at the University of Konstanz (Motivation and Emotion, 2013), German high-school and college students were given PDAs (like Palm Pilots, for those who are old enough to remember them), which were programmed to signal the students at random six times per day. Each time, the students were asked to report what they were doing and how they felt about it. Over the two weeks of the study, the subjects reported that the were bored almost 40% of the time! Unfortunately, many of these reports were given during the subjects' academic classes. Indifferent Boredom, or "a general indifference to, and withdrawal from, the external world". Indifferent Boredom, or "a general openness to behaviors aimed at changing the situation". Searching Boredom, "actively seeking out specific ways of minimizing feelings of boredom". Reactant Boredom, involving a desire "to leave the boredom-inducing situation and avoid those responsible for this situation". Apathetic Boredom, similar to Reactant Boredom, but lacking the desire to do anything about it. In a series of studies that combine daydreaming with absent-mindedness, Jonathan Schooler and his colleagues (2002) have developed a method for studying lapses of attention that occur during reading -- what is commonly called "zoning out". Much like the Antrobus studies, the subjects are asked tor read an attention-demanding text, and then report instances of mind-wandering -- either self-caught, or in response to a probe from the experimenter. One of the most interesting findings of these experiments is that subjects are often unaware of their mind-wandering. Obviously, they're aware of mind-wandering when they catch it and report it themselves. But apparently, subjects do not always realize that their minds have wandered from the assigned text until the probe draws their attention to it. Based on findings such as these, Smallwood and Schooler (2006) have pointed to a paradox: mind-wandering is not just a matter of "zoning out. Rather, attention has become decoupled from the subject's primary task, and shifted to the subject's own personal goals. As in the Antrobus experiments, mind-wandering decreases during controlled processing, which consumes attentional resources. But it increases with practice, as the subject becomes skilled at the task -- making more resources available. This is the paradox: mind-wandering is more likely to occur, the more the subject is skilled at what he is doing. Still, Smallwood and Schooler argue that mind-wandering occurs unconsciously: subjects have no conscious intention to shift attention away from the task at hand, and they are often not aware that such a shift has occurred. Basic Consciousness, consisting of the subject's current perceptions, memories, feelings, etc. Meta-Consciousness, consisting of the subject's conscious reflection on the contents of basic consciousness. Tacit Monitoring, which checks the contents of consciousness for failures to achieve goals, unwanted thoughts, and the like. Automatic, which hold attention on some content by virtue of its affective or sensory salience. Weak automatic c9nstraints permit a great deal of spontaneous thought, in the form of dreaming, mind-wandering, or creative thinking. Controlled, which require deliberate effort on the part of the subject. Strong automatic constraints are lie at the heart of obsessive and ruminative thought. Research on daydreaming, mind-wandering, and "zoning out" reminds us that the brain is always active -- even when it's not engaged in a particular mental activity. This may seem obvious, but it wasn't always so self-evident. As Raichle (210a, 210b) points out, historically, psychology and neuroscience have entertained two quite different views of brain function. One view, associated with C.S. Sherrington (1906), is the brain as reflex. According to this view, the brain lies dormant until activated by some environmental stimulus. Although this is a very old view, it is implicit in contemporary functional neuroimaging studies, which identify brain regions activated by various stimuli, or tasks, by "subtracting out" baseline activity. The opposing view, associated with Hans Berger (1929), the inventor of the electroencephalogram, is of the brain in constant activity. Berger discovered that the EEG showed brain activity even when subjects were at rest: what was initially known as the "Berger rhythm", or now as alpha activity. Sherrington's view dominated neuroscience for a long time. You can see the effect pf this assumption in what might be called the standard paradigm for cognitive neuroscience. Consider, for example, the paradigm employed in countless studies of functional brain-imaging. Subjects are asked to perform some sort of task (like viewing pictures of familiar faces), and the experimenter records the activity of the brain while the subject is so engaged. The experimenter also records brain activity during a control condition -- either a baseline in which the subject isn't performing any particular task, or in which the subject is performing some contrasting task (like viewing pictures of unfamiliar faces). Brain activity in the control condition is subtracted from that in the experimental condition, to yield a pattern of activity that is specific to the task assigned ot the subject. Especially when the comparison is between the experimental task and the baseline, it seems to me that the underlying (if often tacit) assumption is during the baseline condition the subject isn't thinking about anything at all. Or, put another way, the brain is only active when subjects are engaged in some task. More recently, however, neuroscientists have come to appreciate Berger's view, that the brain is intrinsically active. The assumption of pure insertion -- that brain activity is instigated by external stimuli -- is now understood to be incorrect. Some regions of the brain are active even during control tasks when subjects are resting with their eyes closed, or simply maintaining fixation on a visual target. These regions are de-activated when the subject engages in goal-directed activity. task-positive, associated with active task engagement and an undistracted focus of attention. task-negative, when the brain is not otherwise engaged, and the subject is engaged in daydreaming or mind-wandering. In fact, Raichle and his colleagues (2001, 2010) have argued that task-negative activity entails a specific pattern of activation, which he calls the default-mode network (DMN). Depicted in the slide at the left, the DMN consists of medial portions of the temporal lobe and prefrontal cortex, the posterior cingulate cortex, and the medial, lateral, and inferior portions of the parietal cortex. The slide at the right compares brain activity in the "default mode" with activity under other conditions. The areas comprising the DMN show decreased activity when a subject is performing an attention-demanding task. And increased activity when subjects are resting quietly, with eyes closed but awake. Actually, Christoff et al. have identified two, maybe three, default-mode networks -- or perhaps three somewhat dissociable components of a single big DMN. First, there is the Core Default Mode Network (DNCORE), mediating internally oriented cognition, including areas of the anterior medial prefrontal cortex (amPFC), the posterior cingulate cortex ((PCC0, and the posterior inferior parietal lobule (pIPL). Then there appears to be a Medial Temporal Lobe DMN (DNMTL), mediating memory and imagination (mental simulation), conisting of the hippocampal formation (HF), the parahippocampal cortex (PHC), and projections to the cortex from the MTL. And then there is yet another DFN, labeled DNSUB3,whose function is currently unknown, but which includes the dorsomedial prefrontal cortex (dmPFC), the lateral temporal cortex (LTC), the temporopolarcortex (TPC), and the inferior frontal gyrus (IFG). But if we don't know it's function, how, do we know it's part of the DMN? Because it behaves like the DMN. That is, these areas show decreased activity when performing a task, and/or increased activity when resting. Here's the kind of evidence that Christoff et al. obtained in support of these distinctions. They employed an experience-samlpling technique, asking subjects to report what they were thinking about while brain activity was recorded with fMRI. Activity in DNCORE and DNSUB3 increased increased during periods of task-unrelated thought, and internally-oriented thought, while activity in DNMTL increased when deliberate constraints on thought were weak. Interestingly, when activity in DNMTL increased, subjects were unaware that they were engaged in task-unrelated thought. This is reminiscent of Schooler's claim that, sometimes, subjects are unaware that they are daydreaming. Based on their research, Christoff et al. (2016) mapped out the interactions between various networks involved in attention and mindwandering. For example, the DNMTL and the sensorimotor areas serve as sources of variablity in thought content (based on memory or perception, respectively). At the same time, the salience networks, the dorsal attention network (DAN), and DNCORE automatically constrain the output of DNMTL and the sensorimotor areas, increasing the stability of thought. Similarly, the frontoparietal control network (FPCN) is a source of deliberate constraint on thought. The interactions among these networks give rise to various kinds of thinking. In "spontaneous thought", otherwise known as daydreaming or mindwandering, activity in the DNMTL increases the variability in the stream of and encounters few constraints from either the salience network or the FPCN. Be that as it may, Raichle's fundamental point is well taken -- the brain is active all the time, not just when it's been stimulated -- though it's a little sad that we needed brain-imaging to be convinced of that!. And it's interesting that the "default mode" is not just some level of overall background brain activity, involving the cerebral cortex as a whole, but rather a specific network of brain regions. However, I think it's a mistake to identify the DMN with daydreaming or mind-wandering -- simply because daydreaming and mind-wandering are mental activities as well. When you're daydreaming, your thinking about the content of your daydream. Even when you're engaged in mind-wandering, your mind is wandering from one idea or image to another. There's always content. Apparently, the DMN is the neural basis of that spontaneous thinking. Apparently related to the DMN is an extremely slow, spontaneously occurring brain-wave -- less than 0.1 Hz, compared to 1-4 H for the low-frequency delta activity discussed in the lectures on Sleep and Dreams, and named, appropriately enough, infra-slow activity (ISA), which is observed when organisms (including humans) are in the resting state. A study by Raichle and his colleagues (Mitra et al., Neuron, 2018) found that the ISA, like delta activity, was observed when mice were resting (literally in a hammock! ), but disappeared when they were anesthetized -- suggesting that ISA has something to do with consciousness. In an interview ("Thinking Slow" by Tanya Lewis, Scientific American, 07/2018) Raichle offered an oceanographic analogy: ISA is like a groundswell, running underneath visible waves; task-specific activity, reflected in higher-frequency brain waves, then is like whitecaps, which are formed from the groundswell. Maybe. Or maybe ISA is just another brain wave. Discovery of the DMN signals a victory for Berger over Sherrington, but it also has implications for the identification of functional specializations in the brain. Consider, again, the standard paradigm for cognitive neuroscience, discussed above. In such studies, the researcher is interested in identifying the neural module, or system, that performs some function -- such as recognizing a face. In fMRI, subjects are scanned while they're performing the task in question, and they're also scanned while performing some control task - -such as recognizing a word or describing a face. The brain activity recorded while performing the control task is subtracted out of the brain activity recorded while performing the target task, leaving only the activity that is specific to performing the target task. This subtractive method is, essentially, the same one used by Donders in his 19th-century reaction time studies aimed at decomposing mental processes, and by Sternberg for the same purpose at the dawn of the cognitive revolution in the 1960s. But it's obvious that the identification of some functional specialization depends entirely on what's been subtracted out. If you're interested in the neural system that recognizes faces, you'll get different results if your control task involves recognizing words, than you would if your control task involves recognizing faces. The implication is that, if you want to accurately delineate the DMN, you have to pay just as much attention to the control task as you do in standard functional neuroimaging experiments. task-negative, meaning that the subject isn't thinking about anything at all. Only one minor detail: how to get subjects to think about nothing. In fact, that's precisely the goal of certain Eastern meditative traditions, to which we now turn. Link to Lecture Supplement on Meditation. This page last revised 07/26/2018.